At Woolfson Eye Institute, we believe in full transparency and disclosure, as making a decision regarding your vision is one of the most important decisions that you will ever make. In fact, we encourage you to do your research in regards to LASIK surgery, talk with your family and friends, and determine if LASIK is right for you. In order to help you with your research, we want to share a brief article with you covering some of the risks associated with LASIK surgery. It is important to note that just as in any other walk of life, results may vary, and the person (or in this case the surgeon) you choose to perform the procedure for you is of extreme importance. At Woolfson Eye Institute, you can rest easy knowing that our surgeons, lead by Founder and Medical Director Dr. Jonathan Woolfson are among the leading LASIK surgeons in the United States. According to most estimates, there is approximately a 1-2% chance of under- or over-response using LASIK, with an over-response typically being more common (as the cornea becomes more stable following surgery, over-response generally subsides). Anyone who tells you that you will absolutely under no circumstances need to have a LASIK enhancement or wear glasses on occasion ever again is making a promise that they cannot keep. Some people’s eyes have a tendency to regress over time following a LASIK procedure, but we make every attempt possible to factor in and account for future regression at the time of your LASIK procedure. Dry eye is more common following LASIK in individuals who experienced dry eye before the procedure. It is typically more severe in the first couple of months following the surgery and then subsides in months 3-6. Most patient’s corneal flap heals and re-bonds to the underlying stromal bed with minimal complications. However, approximately 1 in every 2,000 – 3,000 patients who undergo LASIK experience flap complications. Again, this is another reason to not choose “cheap” or “inexpensive” LASIK services. At Woolfson Eye Institute we offer the highest quality LASIK combined with the most modern technology in order to minimize risks associated with your procedure. To learn more about the LASIK procedure, including everything you need to know in order to make an informed decision, we encourage you to contact us for a complimentary consultation. 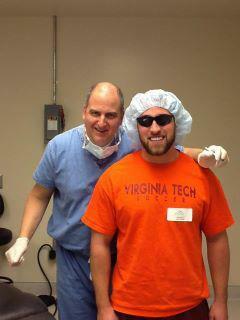 Our LASIK doctors will visit with you and answer any questions or concerns that you may have regarding LASIK surgery. This is a no-cost, no-obligation, low pressure consultation service that we offer to all potential LASIK candidates. To schedule your consultation, give us a call or contact us through our website today!